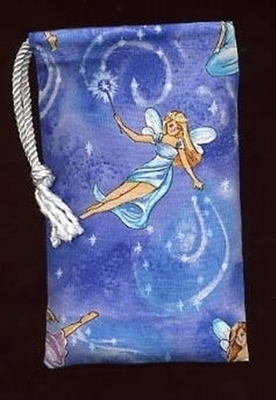 Wand-bearing fairies fly and pose across a periwinkle and lavender sky on this Faery Gathering Tarot Bag. Swirls of magic and stardust from the tips of their wands mirror the opalescent creams and pale blues of their wings and dresses. 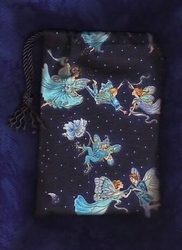 These charming fairies have gathered to watch over your tarot cards and infuse them with their magic! 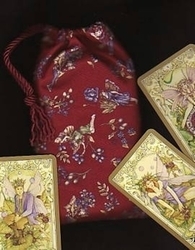 Deck Suggestions: The tarot cards shown below with the Faery Gathering Bag are from the Mystic Faerie Tarot by Ravenscroft & Moore. (cards not included). 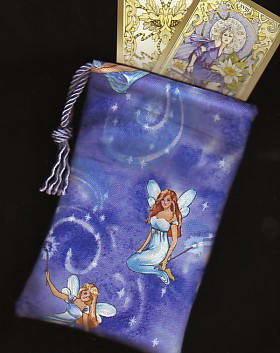 The color scheme of this bag is a nice match for backside design of Nathalie Hertz's Faerie Tarot. 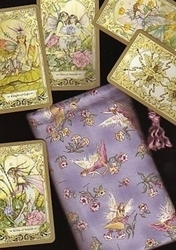 It also pairs well with the Crystal Visions Tarot and the Victorian Fairy Tarot. Size: Measures approx 5" by 7-3/4" (just under 13 cm x 20 cm). Fits most standard tarot card decks (3" x 5" or smaller). 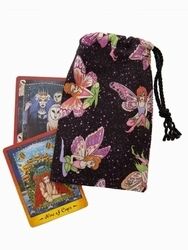 Design: Our single draw tarot bags are designed to last you a lifetime. All the seams are triple stitched and the drawstring opening is reinforced. See our Quality page for more details.